When it comes to the different ways to enjoy using your trampoline, most of us think we have it sussed. Surely it's just a matter of bouncing up and down? Not so, according to fans of trampoline dodgeball. 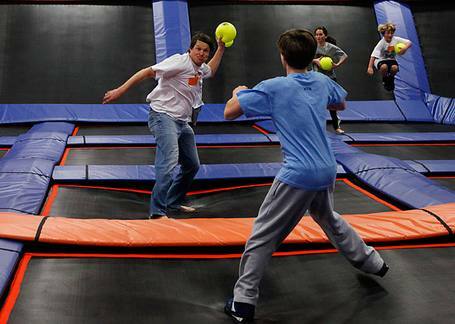 Previously a game limited to school recess, more and more Americans are getting back into dodgeball, but this time with a twist: it's on a trampoline. Incredibly, trampoline even has an annual National Tournament in Los Angeles. Apparently, it can get pretty competitive and teams play for big prize money. 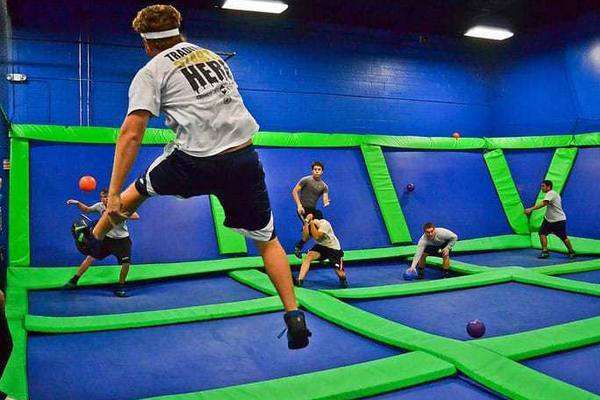 However, assuming that playing trampoline dodgeball competitively is not in your immediate future, you may want to consider playing a form of this fun new sport at home. If you have a trampoline in your own back yard and a dodgeball ball, this is a game your whole family can enjoy. So, how exactly do you play trampoline dodgeball? Whilst proper trampoline dodgeball requires a huge two-sided court made entirely of trampolines, we are assuming that you intend to play this fun game just for enjoyment in your backyard. As long as you have a trampoline, a yard large enough to run around in and a reasonably soft foam or inflatable ball, you have everything you need to start playing dodgeball right away. Please don't use a hard ball like a soccer ball or a tennis ball. No matter how careful you are to remind your kids to throw gently, once they're involved in this exciting game accidents can and do happen if they get carried away and the ball is too hard. Soft and light balls ensure no-one gets hurt. 1. Split into two equal sized teams. One team should be on the trampoline and the other should be running around in the yard. Please remember to check how many people can safely use our trampoline at once. If it is just one, people will need to take turns on the trampoline. You won't be able to play with your safety net up, so you may decide it is safer all round to just have one person on at a time in any event. 2. The object of the game is for the trampoline team to get the yard team 'out' by throwing the ball at their legs. If they are hit by the ball, they must sit out until the end of the game. The yard team should try to dodge the ball, hence the name of the game! 3. The last player left in the yard is the winner. There is a variation of this game where the roles are swapped, where the yard team throw the ball at the people on the trampoline instead. While this may sound like fun, be warned that this version is much riskier. A player intent on dodging the ball whilst bouncing could easily fall from the trampoline or trip over the ball. Of course, this is much safer if you happen to have an in-ground trampoline model. Teams must be of equal size. Balls should be aimed to hit beneath the waist, and shots to the head are particularly forbidden. The ball can be held for 10 seconds only. The whole point of playing trampoline dodgeball is to have fun, so if you are just playing for enjoyment at home, whatever space you have available is fine. This comes with the caveat that there must be enough space for players to move around safely and it should be cleared of any obstructions that could be trip hazards. 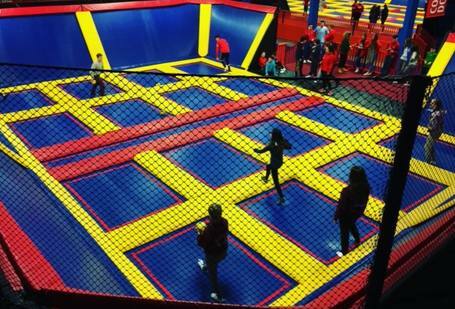 However, many trampoline parks now have full sized dodgeball courts measuring up to 60ft x 60ft. If you want to take trampoline dodgeball a little more seriously, as long as you can muster a team many trampoline parks run dodgeball leagues. This is a great way to have fun with friends, so it's worth contacting your nearest trampoline park or checking out their website to see if there's one running in your area. Alternatively, some parks also offer fun tournaments that are open to beginner teams. Before you assume it's just for kids, you should know that many adults are getting in on the act too! As long as you are fit and healthy, there's nothing to stop you enjoying taking part in a trampoline dodgeball tournament! Sadly, trampoline dodgeball is not yet a professional sport. However, with the rise of the National League and its huge surge in popularity in recent years, who's to say it won't become so in the future! If you would like to try playing trampoline dodgeball on a proper court, you may be wondering where to go. Trampoline parks are probably your best port of call. Whilst many people think of trampoline parks as big bouncy playgrounds geared towards kids, lots of parks have cottoned on to the growing popularity of trampoline dodgeball. Not missing a trick, lots of trampoline parks have constructed proper purpose-built courts. As they have become trendy in recent years, most people will find they have a trampoline park within reasonably easy reach. So, if you think trampoline dodgeball sounds right up your street, give your local park a ring to find out if they have dodgeball facilities. Having read our guide, hopefully you'll agree that trampoline dodgeball sounds like a lot of fun! Whether you are playing in your back yard or at a full-sized court in a trampoline park, this exciting new sport is a great way to get your daily exercise while having a great time. Remember, if you're playing with kids, always remind them of the rules beforehand to make sure they play safely and avoid any nasty accidents. Also, always consult your trampoline's manual before allowing more than one person on your equipment at once. Have fun, and happy bouncing!